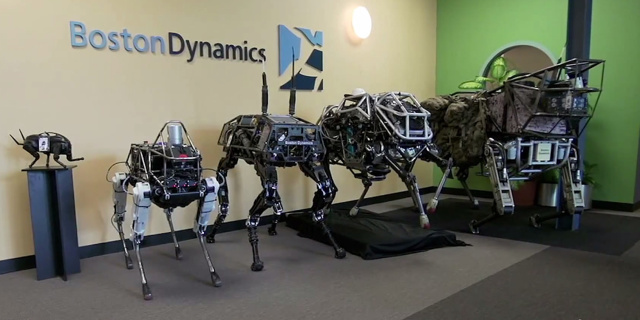 Boston Dynamics engineers are very fond of designing robots. And not banal humanoid, but four-legged ones. They created the “dog” named BigDog and “wildcat” the Cheetah. However, these machines are large and heavy. They are suitable not for every job. Therefore, the company made Spot. It is not afraid of rugged terrain. Another invention is moving inside buildings. Spot perfectly oriented in a confined space, isn’t afraid of narrow corridors and easily “storms” the stairs. Its massive “relatives” cope much worse. The device perfectly keeps the balance and is not really noisy. This is achievable thanks to the electric propulsion system (instead of engines for karts, Boston Dynamics used in the previous experiments). It looks amusing novelty. If things go well, the corporation will soon gather a mechanical menagerie.